Comments (Hunter Higgins): Illustrated by JAT. 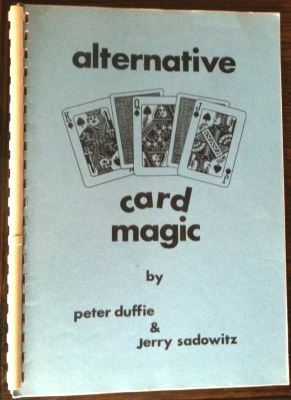 This rather small spiral bound manuscript consists of 28 pages of card magic from the minds of Peter Duffie and Jerry Sadowitz. Each author offers 20 tricks, the cream of the crop being Jerry Sadowitz`s adaptation of the Travellers, which he calls The More Things Change.